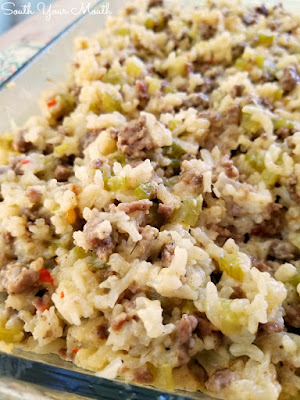 Sausage and Rice Casserole is a simple recipe perfect for supper, side dishes, potlucks and Thanksgiving (sometimes called Rice Dressing or Rice Stuffing). Anybody that’s been here a while knows about my love affair with rice. And that my poor ol’ Canadian, potato-loving husband is just out of luck. Because if I’m doing the cooking, we eating rice. And p.s… to the fella that said rice is yankee food on the facebook page the other day… um… well, the East Coast low country and the Gulf Coast bayou were built on rice so, those of us in those areas have rice in our blood. And that covers a pretty good chunk of the South. Whew, I've wanted to get that off my chest for a few days now. I feel so much better! I noticed they were hanging around pretty close as I was taking pictures. When I was done I gave them spoons and let them go to town. And those two little suckers just about knocked the bottom out of my casserole dish! I finally had to take it away from them! God bless them. God bless their little rice loving, green stuff eating, Southern hearts. Brown and crumble sausage in a large skillet. When sausage is about half cooked, add onion, celery and red pepper flakes then continue cooking until sausage is no longer pink and veggies are starting to become translucent. If your sausage is particularly fatty, drain off some of the fat – I usually don't. In a separate bowl, whisk together broth and soup until smooth. Pour soup mixture and rice into skillet and stir until all ingredients are thoroughly incorporated. Pour into prepared casserole dish, cover tightly with aluminum foil then bake at 350 degrees for 1 hour or until rice is tender. Remove casserole from oven and let rest, covered, for 15 minutes before serving. You can use other creamed soup flavors but I highly encourage you to use Cream of Celery so things aren't too “chickeny” (now, there’s a word I never thought I’d use). This recipe doubles BEAUTIFULLY in a 3-qt 13x9 dish. Cook for 15-30 minutes longer or until rice is tender. I almost always double it. If serving as a side dish, this makes 4-6 servings. As a main dish, it serves 3-4 (or maybe 5 skinny people). I am DEFINITELY trying this. I've had a cough for the past week and my boyfriend keeps trying to get me to take cough syrup. And I refuse. But a homemade version...I am totally going to try! Our family puts in a can of Chicken Noodle Soup instead of broth and we use a can of Cream of Chicken Soup! Diced onion sautéed in butter is delicious, too! Brown rice is a good alternative also! Yes but you'll want to add some salt, pepper and garlic. I do the same with hambuger meat, at my place it's called chinese style hamburger hash. The last 15 minutes in the oven, we put some crunchy chinese noodles on it and it adds a nice texture. The noodles reheat soft though, so only use what you need for the meal! You could use ground beef, yes! But add seasonings (salt, pepper, garlic, etc.). As for which type of sausage, I used Jimmy Dean's hot pork sausage. I've made the ground beef version a lot in years past and it is good, but it's Asian inspired. I'm ready for this one and am always curious about what sausage, exactly, to buy - silly I know. I so appreciate that you always respond. It means a lot. And now I know the rice answer before I wondered! Thanks again. Can I use Italian Sausage?? what if you ONLY have minute rice? Think it would work or be too soggy? Want me to guinea pig it? I used same amount of broth and soup, used 10 minute rice and baked for 45 minutes. It was perfect! i used minute rice put a lid on the pan and cooked it on the stovetop. I do not put it in the oven at all. A one pan dish. I've been looking for something different to make and this looks so good. I would use brown rice and ground beef or turkey though, not a fan of sausage. Maybe add some green pepper and diced tomatos? Adding some cheese in one form or another might not be bad either. Thanks! I just made a chicken and rice soup that had, in addition to the broth and water, a can of cream of celery soup. It made the broth just a little thicker, a little richer, and a little more delicious! Now seeing this recipe, I'm beginning to think that maybe cream of celery soup is the glue that holds the world together! I know, right?! WHO KNEW?!?!!! I was truly impressed and surprised! So, could you double the recipe and use a 13x9 inch dish and take to a potluck? Also, do you use this as a main dish or side? Yes, I think that would work perfectly! Main dish vs side dish - largely depends on how much one puts on ones plate. Personally, I believe I would opt for main dish. My mom makes a recipe similar to this but uses a pack of Lipton Noodle Soup dry mix instead of the cream soup. It's always a hit with the kids. I may have to try this version. My dad got me started on eating Cream of Celery soup as a soup as a kid, and I've loved it ever since! Hi, I would like to know if I can get your recipe! OMG This looks so good! You can believe I'll be making this real soon. I wonder if I can just dump everything right in my rice cooker - after browning the sausage and onions of course. I bet it would work. I can't believe some guy said rice wasn't southern! That right there is as southern as you can get! Heck, next door in Louisiana they make sausage out of the stuff! I have no clue about the rice cooker! I don't have one so I don't know how they work. LOL...rice is universal! In Minnesota, we add it to our venison..when we make sausage. Its wonderful and takes on the flavors. Not southern? Heck, we grow rice in the south, why wouldn't it be southern? Grew up on the stuff, all kinds of ways from breakfast to dessert. Not southern indeed! I made this tonight for dinner and it was quick and delicious, thanks Mandy! During the summer, when the garden is on overload, I add cubed boiled & drained eggplant. I don't really like the taste of eggplant but will eat it like this. I plant 1 eggplant plant so I can make this. The kids don't even know there is eggplant in it. I make one similar but brown the sausage, cook the onion & celery in butter, cook the rice with 2 pkg dry chicken noodle soup mix and 2 c. water (cook as directed for rice) then mix it all together, add some salt & pepper & pour into a buttered 13x9 pan. Bake at 350 until lightly browned - about 20 minutes. We are having this tomorrow matter of fact, just bought the ingredients today. Just made this last night....found my new favorite soup....cream of onion! Reduced the amount of onions I put in and used a can of the onion soup.....Hubby didn't even have left-overs for work! YUMMY!!! Thanks for all you do! I use Cream of onion soup in everything that asks for cream of celery or mushroom. Very hard to find here so my friends send me hunting. You should see what happens when it's on sale! 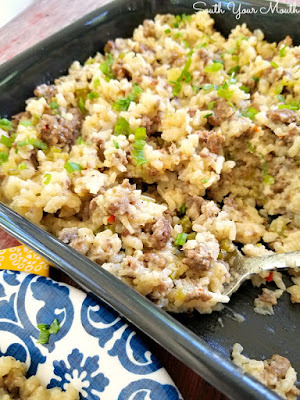 I'm on a low carb, low sodium and sugar diet, I would modify this if anyone is interested in trying to be a bit healthier with it, by swapping out the white rice for riced cauliflower, using low sodium broth and using extra lean ground meat (perhaps turkey, but pork is good too), adding some additional spices that do not contain salt...will try to substitute the cream of celery as well. I ABSOLUTELY love how most comments are like " from way back when!"!!! You so rock lady! I made this last night. I used partial can of Rotel instead of the red pepper flakes. It was awesome. I think next time I will try it with more meat. I was just wondering... do you know about how many servings/what size servings this makes? I have made something very similar, but instead of white rice, I use a mixture of Carolina wild rice and some brown rice and there is never one drop left over...great Thanksgiving side dish. My Mom has been making this recipe, with the bell pepper, for 50 years. 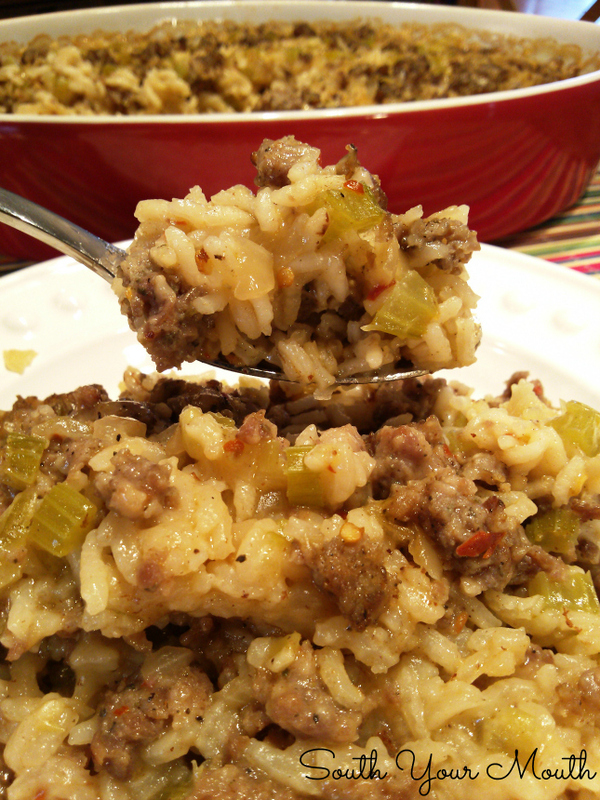 It is a family favorite and one of my go to recipes for comfort food. We bake for 45 minutes, then stir with a fork to fluff it up, then bake for an additional 15 minutes. Yum. I really don't understand why if someone is good enough to post a recipe, that others do their best to change the entire idea of it! Oh well, I for one am going to say that I tried the recipe as written and it is absolutely wonderful! 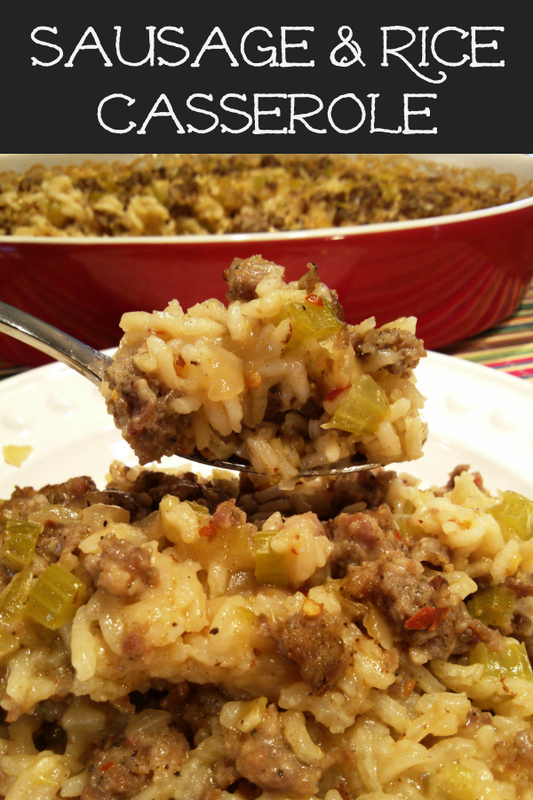 If I want a hamburger casserole I'm sure that Mandy has several posted that will be just as wonderful as this one! Couldn't agree more! "I followed the recipe to the letter but substituted...." No longer the same recipe, folks. At least make it exactly first time around and THEN make it your own. Oy. I agree except that I'm on a very restricted diet and have to revise a lot of recipes as I'm sure a lot of others do also. I do like the idea of this recipes-it sure looks good and I think it could be "healthied" up really easily. I personally appreciate when others comment with their substitutions. If I'm lucky, someone will have already figured out a way to make the recipe fit with my family's diet restrictions (in our case, dairy-free). I think both you "anonymous" need to get off your high horse and not read the comment section if you don't want to see other people's variations. I too like to see substitutions. It can be very helpful especially for someone who has a child with food allergies. I like the substitution suggestions.. helps me use things already in my pantry. Sometimes we substitute because we had something in the fridge or the cupboard and were missing one or more of the ingredients in the recipe. When it's time to make dinner, it's easier to use what you have than go shopping! I like to read about others' successful substitutions: I call them creative variations, and when it comes to cooking, necessity is the mother of creativity! I Saw this on "Weekend Potluck" and thought it sounded very good. Pinning it! Thanks! I absolutely love this recipe! 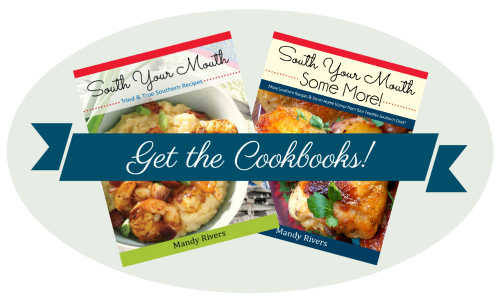 I'm expanding my dinner menus thanks to you!! I've loved every recipe that I've tried. Thank you so much! I've made this recipe with potatoes that I have parboiled. Used same ingredients substituting potatoes for the rice. It was delish! I always serve this with hot buttered cornbread, green lima beans, and fried okra. I'm glad y'all enjoyed it! Wish I had some of those greens! WOW! Y'all must like rice like I do! I hope you enjoy it! Really enjoyed the flavors in this recipe. Agree with a previous review that it was a little salty. Used sodium reduced broth and used mildly spiced sausage meet. My husband says its a definite make again :). Made this tonight for the 3rd time and have loved it every time! Have you ever made it in the crock pot? Any idea how long you'd cook it on low? I don't use rice in the crock pot often so don't know how long those recipes typically take. So glad I found your blog!! I haven't but I think I might try it out soon! If you beat me to it, please let me know how it turns out! Im sorry I posted one of your recipes to facebook. I didn't know I wasn't suppose to do that. I really like this recipe. With all the celery our house smells like Thanksgiving. I was telling my husband that all of our favorite meals are your recipes. Out of nowhere he looks at me and says "I love her." I am new at finding you, found you through pinterest and love this recipe. I switched the chicken broth to beef and cream of celery to broccoli cheese, because that's what I had on hand. My family is so picky, but they all loved it. Thank you for sharing this recipe, I look forward to trying more of your recipes! I loved the flavors in this recipe. Some of the rice did not cook thoroughly, not sure if that is because I used a 9X13 dish. I will definitely be making this again. Thanks for the recipe! This recipe tastes great! I even added some carrots I had in the fridge that I needed to use up. My only comment is if you are using brown rice (like I did because it's what I had in the house), you'll need to cook it for probably two hours. I left mine in for 1 1/2 hours and some of my rice was still al dente. How would you adapt this for crockpot cooking? Sounds Delish! Does the hot sausage make it spicy? I am not sure which to use, the regular or hot sausage. I want to make this dish and enjoy the dish. Does the hot sausage make it hot? I know that is a crazy question, but really want to make for New Year's Day! Thank you! I enjoy trying new recipes. I made this for a pot luck at work - doubled it. Everyone loved it. I make another casserole that is very similar. I use mushrooms and water chestnuts, and soy sauce. We call it Mock Chop Suey. Has anyone tried making larger batches of this and freezing? Thanks for the recipe. I made this tonight and it was a big hit. I found your recipe because I needed something for the "end of the week, and I need to go shopping" dinner and it was absolutely perfect for that! How about Cheddar Cheese soup?? I've used this recipe before and it was a hit, any thoughts on using a crockpot for it??? My Grandmother passed away recently and she used to make something similar called "Rice Continental". I was craving it this week, but when I asked my Mom for the recipe, she couldn't find the file for her recipes on her computer. Found this via internet search, and it seems just right. Just put the casserole in the oven and it smells wonderful! I am gluten-free, so I made a roux with gf flour and chicken broth for the cream soup. Just found this on Pinterest. My mom (feisty 82 year old) and I have a movie night with friends on Sundays. Next one is my turn for the main dish and this will be perfect! Looks like delicious comfort food. Thanks! I showed the picture to my husband of 30 years and asked him what that looked like, he said "your sausage casserole". I've been making this for decades and find the better quality meat you purchase the better the flavor of the dish. I've always used 2 cream soups with milk, chicken & celery, basmati rice adds a nice flavor as well. I will definitely try the chicken stock to reduce the salt, great idea. We like it crispy so I cover for an hour and then cook uncovered for another 1/2 hour till it gets crusty around the edges, I use a large pyrex bowl. Always a winner and leftovers are great in a frying pan, lid it to cook through and uncover last 5 mins to recrisp with some sweet peas on the side. Yum! I've made this for over 35 years. I use a can of cream of chicken and a can of cream of mushroom. I do not use the broth. And I use minute rice. Always a favorite with no leftovers. You can also add some slivered almonds or water chestnuts for crunchy texture, but I usually just add some extra celery. Made this tonight, with veg broth and the cream of celery. Neither my husband or I are big fans of cooked celery, so wasn't sure about using it. Was a big hit! Husband told me at least twice while eating how good it was, then said you have to make this again. Maybe try with cheese next time, but would it interfere with the rice cooking? Excellent! Have made this twice, and while I normally have excellent results with Mandy's recipes, the rice both times has turned out a bit underdone. Followed the recipe exactly with no substitutions, let it rest for even longer than called for. Used a good quality brand of rice. Any ideas? Flavor is great, but family has no more patience with me when they get to the dinner table and see anything with rice! I would add a little water when you mix everything up and cook it for 10 minutes longer. Hope that works! I often have to cook my rice dishes longer as well. I live in SLC, Utah, so I wonder if it's because of the high altitude. Hi Mandy! I'm looking to make this for my son's 1st birthday brunch. Do you know how many servings this feeds? Also, if serving for a large crowd do you think it will do well if I 6x the recipe and cook it the night before and heat up the morning of? I would say it makes 4 entree servings or 6-8 side dish servings. If you make that big of a batch, you'll want to cook it longer to get the rice done. I think it should heat up beautifully! Happy birthday to your son!! I REALLY love this recipe!!!! I have made it four times so far and tend to make it more! Hi Mandy! Thank you for sharing this recipe- it brings me right back to when I was a little girl at my grandmother's house! Since I am a Cajun girl, I used Creole Seasoning (pre-chopped onions, celery, green peppers, garlic and parsley) instead of the onions and celery, ground beef instead of the sausage, and brown rice. It was amazing! You should know that it was very hard to wait the whole hour while the dish was in the oven. It made the house smell so good! And tastes even better than it smells! Thanks again! If freezing this dish for a quick meal later, would you bake as directed and them freeze? Anyone try this in the crock pot? I made this recently and it was very good. The recipe did not specify breakfast sausage or Italian sausage. I used 3 links of Italian sausage as I did not feel it needed a whole pound. This was easy to prepare and everyone liked it. I made this for dinner tonight but because it was getting late, I used 1 and 1/2 cups of minute rice on the stove top....it was wonderful. I used cream of mushroom soup with chicken broth and added mushrooms to the sausage, onion and celery. I let that mixture get really hot before adding the rice. After simmering on low for about 5 minutes I turned the heat off and let it sit so the rice didn't get soggy. Start to finish, less than 30 minutes! Thank you so much for this recipe! A dear friend mentioned her mother used to make this for her Yearly Birthday Dinner. Recently she had surgery so I brought this over - she/they loved it. Today I'm making it for another ill friend! I'm a vegetarian so I have no idea what it's like but they love it and I love them so thank you for that!! This iw pure comfort food ya'll! I add extra pepper flakes (hey, we in north Texas) and extra broth ( I doubled the recipe). Hit with my family expecially in this cold weather with some mexican cornbread on the side. This is a keeper for us and will be repeated. thanks so much for this recipe!!!! I was really scraping the bottom of the pantry trying to put off the grocery store for one more day. I used Owens Hot Sausage, the cream of celery soup and a can of French Onion Soup with a cup of Konriko Brown Rice. I did not add any additional onion, celery or red pepper flakes. Spicy and creamy good. My husband had two helpings and fixed a bowl to take for his lunch tomorrow. He usually eats lunch out so I know this is a keeper recipe even with my changes. I love this recipe, made it successfully before, so am making it for Bible Study group tonight and just realized I bought Cream of Broccoli on accident!!!! ACK!!!!! Here goes nothing. I am currently making this, but with a cream soup I constructed from scratch since I was out of the canned kind. I have high hopes! I made this about a year ago using the above recipe, but instead of rice, I used rice cauliflower and it was amazing ... I'm making it again tomorrow, using river cauliflower, and cream of mushroom soup this time. I bought italian sweet sausage..will this be okay for this receipe. It was DELICIOUS! I'm so glad to know I can alter this recipe so much to use what I have in the pantry! can you use long grain brown rice? Probably but you would need to cook it longer. I don't like celery, what can I use instead?? Can you prepare everything the night before and put in a dish and cover and keep in the refrigerator to cook the next day? I wasn't sure if it would make the rice soggy. I think it will be fine but you'll have to cook it longer since it will start cold instead of warm. 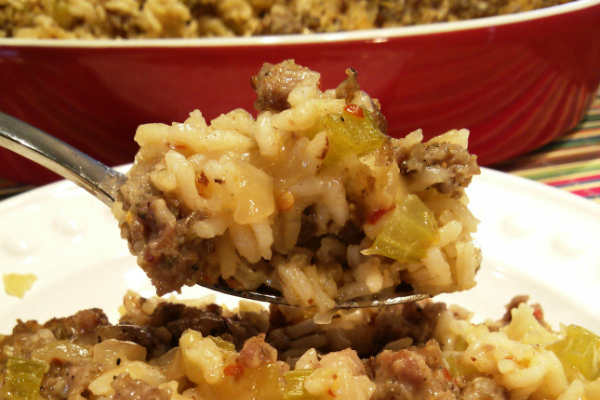 I made this with sweet Italian Turkey sausage and it turned out very good. I made this last night, and it was simple and good. Observations - 1.5 qt dish didn't start to hold the ingredients. It did hold the half I had left over. I ended up cooking it in a my deep-sided saute pan on the stove top to save time, (20 minutes on low and then rest for 15) and it came out great. I also added some diced mushrooms to the celery and onion mix, and I added grated cheese on top when serving. I've mixed some Creole Seasoning into the leftovers to reheat tonight - hoping for kind of a dirty rice effect for variety. My Aunt used to make this when she came to visit, it was always my favorite. She’d put diced pimientos in hers as well. My dad would get onto me for putting so much on my plate and my Aunt would say, “now, now, I made it just for him. �� I saw the recipe for jailhouse rice and I to have made this in many different combinations and it’s ALWAYS delicious. I’m glad you posted the recipe and I hope people that have never tried it give it a chance. I love this recipe so much, I make it exactly as is a few times each month. Have you ever frozen it prior to baking? If so, how did you adjust the cooking time? I haven't tried it. If you do, let us know how you did it and how it turned out! Mom used to make this weekly. She added mushroom and cheese. I’ll definitely be making it soon!! Love your recipe! I have found the many comments and suggestions people have added helpful. This is the third time I made this recipe. This time I decided to try the following; Italian Sausage, brown rice, 1 cup of greek yogurt instead of the soup, used a good quality low sodium chicken broth, 1 cup fresh mushrooms, 1 tbsp. cornstarch (needed a little thickening), 1/2 tsp. garlic & onion powder. According to my husband this is the keeper (he liked the bolder taste of the Italian Sausage)! One of my favorite recipes! Wondering how I might need to change it to do it in the Instant Pot. Waiting an hour for it to cook plus 15 min to set is a long time on busy weekdays. If you have a thought about time in the IP, as well as maybe more liquid, I'd love to hear your thoughts!